​On my monthly Costco shop, I always buy a package of flap meat. It makes the best steak for the best price ($8-9 per pound - used to be $6!). It's a splurge but we get two "fancy" meals out of our $25 purchase. It comes in two pieces, so I put them in the freezer individually in gallon bags (I usually thaw by submersing the meat - still in the sealed bag - in a bowl of hot water for about twenty minutes). To make this delicious steak, I heat up butter (or bacon fat) in our cast iron pan on medium high, turn on the fan, and cook it on one side for 5-7 minutes. I flip it and repeat. Sometimes I have to flip it one more time to get it perfectly medium to medium rare. I let it sit for a few minutes before slicing against the grain. If I am cooking onions (usually red), I cook them in the (greased) pan for about 5-10 minutes and then add the steak, cooking them both together until the onions are nicely charred (I take them out before the steak). Sometimes I add mushrooms, but if I do that I usually cook it all before I make the steak, so as not to overcrowd the pan and because mushrooms are liquidy. This is one of our favorite family dinners - steak, mashed potatoes, and salad (the kids don't have the onions and blue cheese - more for us!). I confess to watching one reality show: Hell's Kitchen. Every summer my foodie husband and I eagerly await the next episode. 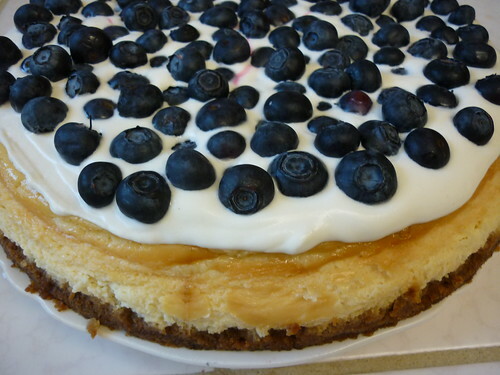 Currently we are down to the final four chefs, so it seemed like the right time to share the recipe for Gordon Ramsay's Baked New York Cheesecake (it's all over the web, but that links to my favorite cooking site), which I recently made for a family gathering. It was devoured by everyone, ages 3 to 69, and I got compliments all around. I tweaked it just slightly: I added cinnamon and sugar to the crust, omitted the sultanas and lemon juice that were supposed to be folded into the batter, made a topping (sour cream + whipped cream + sugar + vanilla) and covered it with blueberries, rather than just dusting it with powdered sugar. Two techniques that worked beautifully: covering the bottom of the springform pan with foil (kept it from sticking) and keeping it in the oven for an hour after it was done (kept it from cracking).